There has been a lot of interest lately in electric motor dynos. I’m not certain why this is, except that many racers seem to feel that if they had a dyno they could make their boats run faster. The truth is, a dyno may or may not be of any help to the average FE racer. Most hobby dynos available for car motors are not well suited for boat racing. The dynos seldom will allow high amp testing, and that is where we need to test our marine motors ( 40 to 50 amps ). Also, they usually supply incorrect voltage to the motor, complicating a true test of the motor. They are also expensive, and the vast majority of fat electric racers would be better off spending that money on top grade cells or motors. A simple dyno will tell the racer how many amps his motor will draw at a certain voltage and rpm. From this he can calculate the power produced, but what good is that really? The dyno will also tell him that his 15-turn 05 motor doesn’t produce as much power as his 11-turn motor does, but he didn’t need a dyno to know that. Even if he knows the maximum power and rpm, he will still have to experiment with props in the boat on the water to find the right one. So, what good is a dyno to the average FE racer? For the average racer, the biggest advantage to a dyno is in fine tuning his motor, either with brushes, springs, or timing. He can also compare two or more similar motors ( ROAR motors come to mind ) and see which one is putting out the most power. If the racers is expecting to run substantially faster by using his dyno, he’ll probably be disappointed. If he wants to get the last little bit of power out of his motor, then the dyno may be of help. Digital Mini-Tach - Tower or GloBee, etc. Battery Pack to match boat. Mount the motor on a spacer block high enough off the wood plank for a 7” diameter prop to clear. You could use one of the plastic motor tester mounts, but these lack strength if you are looking for a high power 6 to 8 cell motor. I used an aluminum motor mount out of a boat. Attach the motor/mount/spacer block securely ( use screws from underneath the plank ) near one end of the plank, but position it so the prop does not extend past the end of the plank. I’m right handed, so I put the prop on the left end of the plank. The tach will be securely glued ( silicone works well ) to a block of wood positioning it about 1” to the right of ( behind ) the prop and high enough so that the prop arc passes in front of the tach input port. You can mount the Whatt Meter to the plank with servo tape, positioned a bit further to the right of the motor mount assembly. Attach the on/off switch to the board between the pack and Whatt meter and mark the OFF position plainly. A strip of velcro will hold a battery pack near the right end of the board. I used LightSpeed connectors and 14-gauge wire between the motor and switch, the switch and meter, and meter and battery. This allows the motor, Whatt Meter and pack to be removed easily. The airplane prop will produce a lot of thrust, so I recommend that you glue a small brick or other heavy object to the left end of the plank. This will keep the dyno from “taking off” when testing a powerful motor on 8 cells. Before we start to test the first motor, I want to stress the fact that you CAN be hurt while operating the dyno if you are not careful. That airplane prop can cut you badly, so ALWAYS wear safety glasses, stay to the right of the prop arc, and NEVER allow anyone to stand anywhere near the left end of the dyno! This type of dyno has been used for many years, and I haven’t heard of anyone seriously hurt by one, so don’t be the first. Securely mount the test motor to the motor mount, then attach the first prop. I suggest using one of the smallest props first. Make sure the adapter and prop are securely attached, then plug the battery pack into the meter. The meter should read no volts; if it reads voltage, the switch is in the ON position - turn it OFF now. Only when you are certain that the pack is turned OFF can you then plug the motor into the meter. Now the prop won’t start up and startle you when you plug in the motor. Turn on the dyno. The prop will make quite a bit of noise - this is normal. Stop the motor after a few seconds and unplug the pack, then check the tightness of the prop and adapter. If all is well, turn on the tach and then the dyno. Record the rpm and the amps and volts from the meters, then shut the dyno off. Short runs are best so that the motor temperature stays cool. Top off the same pack on the peak charger ( do this between every test ) and change to the next larger prop. Repeat the procedure for several props, but stop when the amp draw exceeds 50 amps - no need to go higher for most applications. Now that we have some numbers, what do we do with them? I could turn this article into a complex technical discussion, but that won’t help many racers to use their dyno. For now, I’ll explain how to use the dyno to compare motors or motor tuning changes. 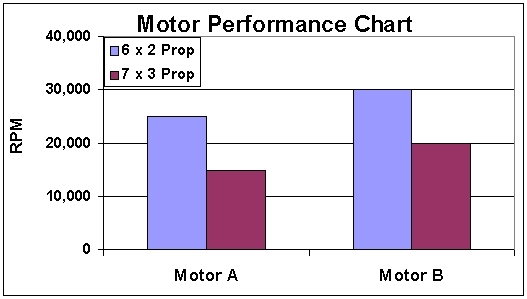 The comparison here is easy, since we can see that Motor B turned both props faster than did Motor A - see the chart below. Since each prop absorbs the same amount of power at the same rpm, spinning it faster means that more power is produced. Motor B also drew more amperage from the battery, another indication that it was producing more power. Again we can see that the Setup 2 turns the props at different speeds. While this brush/spring combination lost some rpm at low amp draw, it spun the 7 x 3 prop faster so it made more high rpm power. This means that the “2” setup is better for racing where we want maximum power, but the “1” setup is probably better for sport running since it draws less amperage and will run longer. Copyright © 1997 - 2009 Donald Wollard III & RumRunnerRacing.com All Rights Reserved Worldwide. Use is strictly prohibited.